Arizona football head coach Rich Rodriguez has been accused of workplace misconduct by a former administrative assistant. You may have expected to see Arizona coach Rich Rodriguez on the hot seat this offseason after the Wildcats lost four of their final five games. But that’s not why Arizona is considering letting their coach of six years go. Beyond the on-field performance, however, the school also has been dealing with a troubling allegation behind the scenes that led school officials last fall to hire an outside law firm to investigate Rodriguez for potential workplace misconduct, according to the people with knowledge of the probe. More specifically, the claim to the Attorney General’s office was for sexual harassment and a hostile workplace, according to the Arizona Daily Star’s Greg Hansen. If that lawsuit is filed this week as Arizona officials expect, it could bring significant negative publicity, particularly in the current national environment. Rodriguez led Arizona to its best campaign this millennium in 2014. The Wildcats started 10-2 and won the Pac-12 South but finished the year with losses to Oregon in the Pac-12 championship game and Boise State in the Fiesta Bowl. In the three season since then, Arizona has compiled a 17-21 record (9-18 in the Pac-12). Rodriguez entered the 2017 on the hot seat after a 3-9 season, but Arizona’s resurgence, led by quarterback Khalil Tate, appeared to have bought him some time until a late-season collapse. It’s no shock that Arizona is considering letting go of Rodriguez in light of the new allegation considering the school already has multiple legal issues to face. Arizona is being sued by a victim of former running back Orlando Bradford, who was sentenced in November to five years in prison for aggravated assault. Former track and field assistant coach Craig Carter is facing multiple felony charges for blackmailing a student with whom he had sexual relations. We’ll see how things shake out with Rodriguez. According to USA Today, the university expects to arrive at a decision soon. Update: Well, that didn’t take long. According to USA Today’s Dan Wolken, Arizona and Rodriguez parted ways about an hour after the original story broke. 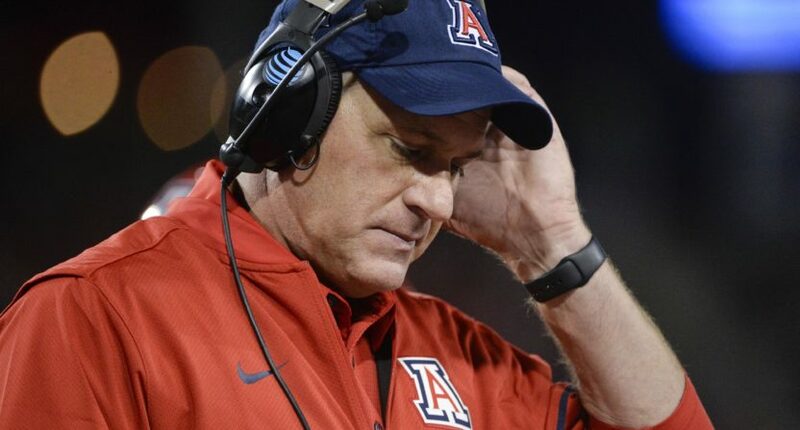 BREAKING: Rich Rodriguez is out at Arizona, sources say.